Lee Wengraf provides an important reminder that Africa’s position within the world economy is heavily determined by its unequal insertion into the global capitalist system and ongoing manifestations of imperialism. A focus on politics within African countries might offer further pointers as to how this status quo is reproduced and how it might be changed. The idea of ‘Africa Rising’ is on the wane. Sustained economic growth from the early 2000s in the midst of a global commodity boom, which saw the general view of the continent shift from irredeemably hopeless to promisingly hopeful, has slowly given way to renewed pessimism regarding the imminent onset of a ‘new debt crisis’. The new narrative is one of a wasted boom – in UK parlance, a failure on the part of African governments to fix the roof while the sun was shining. The story goes that they have failed to wisely reinvest windfalls to diversify away from primary commodities, incurred huge debts spent on frivolous public infrastructure, and have left the majority of Africans still mired in poverty. For the IMF, business press, and mainstream economists, Africa is once more entering a crisis of its own making, rooted in the familiar problems of poor governance and corruption. Scholar-activist Lee Wengraf’s book, Extracting Profit: Imperialism, Neoliberalism, and the New Scramble for Africa, provides an important reminder of the fallacious – and ultimately pernicious – nature of such accounts that obfuscate so much about Africa’s relationship with the wider world. Wengraf seeks to redirect questions of Africa’s development away from locally generated economic distortions and supposed inbuilt civilisational deficiencies, towards questions of power and imperial conflict in the global political economy throughout successive periods of capitalist expansion. In doing so she draws upon a number of different strands within the Marxist canon: principally the seminal work of Walter Rodney and the insights of dependency theory; both Luxemburg’s and Lenin’s theories of imperialism; and Trotsky’s notion of Combined and Uneven Development. The central point is that Western (and now Chinese/BRIC) development and African underdevelopment should be seen as two sides of the same coin, rooted in the legacies and endurance of colonial exploitation and the construction of economies based purely on resource extraction. The book’s first part details the violent Scramble for Africa from the 19th century onwards. The legacies of this are traced through the post-independence era where weak states were continuously subject to Cold War interventions; the US especially aimed to limit communist expansion and secure access to strategic raw materials. Wengraf suggests that nascent African efforts at diversifying economies were thwarted by imperialist-fuelled conflict and the dominance of external capital. Later, amid a sustained drop in global commodity prices, the IMF pushed punitive structural adjustment programmes on countries struggling with high debt and low growth, leading to de-industrialisation and rising poverty. The second part then critically assesses the ‘Africa Rising’ narrative over the last decade. The rapid escalation of Chinese demand for raw materials saw a recovery of investment in Africa, but one that was highly focused on extractive industries. Privatisations had pushed the ownership of mining operations into the hands of foreign multinationals, with investors repatriating huge profits through tax avoidance/evasion. In the absence of capturing revenue locally, African governments incurred large amounts of non-concessional debt from both Western-based finance and the Chinese government. Wengraf argues that new oil and gas discoveries in the context of rising global demand have seen a New Scramble for Africa. Competition for resources has seen a growing imperial rivalry between the US and China, leading to an increasing military presence on the continent as the former seeks to check the rise of the latter – now intensifying during Trump’s presidency. Amidst this, poor Africans have only seen persistent unemployment, poverty, collusion from leaders, conflict, authoritarianism, and environmental degradation. For Wengraf, Africa has not been ‘rising’. Rather, it has merely been subjected to a new imperial scramble for minerals; ephemeral and unsustainable growth; dangerous levels of militarisation; and the repatriation of vast profits at the expense of impoverished African populations. The Coming Crisis is not one of Africa’s own making, but a reflection of its ongoing subordination within conflict-ridden processes of capital accumulation on a global scale. As the boom fades, it will once more be African workers who bear the costs through new rounds of austerity and repression. The value of Wengraf’s account lies in its insistence upon a systemic analysis of the history of African economies in the world market; an approach that views the continent’s widespread poverty as a global relational phenomenon that is socially (re)produced, a manifestation of the contradictions inherent in the long history of crisis-ridden capitalist expansion, driven by imperialist manoeuvrings. This work is another important counterpoint to the endlessly nauseating accounts offered by international financial institutions and their most beloved mainstream economists, where the causes of African poverty are provincialised, viewed as a consequence of pathological traits to be cured through domestic reform and social engineering: corruption, conflict, poor institutions, and plain irrational individual behaviour. It is these assertions that localise responsibility and legitimise neoliberal reforms whilst leaving the operation of systemic power out of the question. At times Wengraf tends towards a simplification of imperial power, presenting Western finance, extractive multinationals, the US state apparatus, and global governance institutions as an undifferentiated power bloc, acting uniformedly in concert. This neglects the sometimes haphazard and contingent interactions between different actors. For instance, the ‘new debt crisis’ in Africa has its origins in the search for yield on the part of Western asset managers in the early 2010s, as a result of central bank efforts in the West to jump-start post-crisis growth through quantitative easing. More recently, declining commodity prices (due to slowing Chinese demand) and nascent reversals in developed-economy monetary policy have led to currency depreciation and reduced revenues in African countries, driving economic volatility (so-called taper-tantrums) and often substantial increases in debt burdens. This situation has not been centrally planned and manufactured, though of course US/UK/EU imperial power will be leveraged in the final instance to enforce austerity, repayment, and protect the balance sheets of large financial institutions – see Greece. Wengraf certainly captures the systemic dynamics of capitalism and state power, whilst erring towards functionalism. This functionalism and general imprecision becomes rather more frustrating however when considering the book’s account of processes within African countries themselves. Indeed, there is a noticeable absence of any real discussion of African politics and country-by-country variations. Dependency theory has long been criticised for presenting a ‘paradigm of the yoke’, where politics is universally reducible to the machinations of external powers, obscuring the historicity of Africa’s relationship with the wider world. Despite references to Combined and Uneven Development, the account presented is rather flat. The specific geographies of imperial power and its various manifestations in different places are not considered. Furthermore, the manner in which different economic bases, political systems, ecologies, ideologies, and forms of social stratification (rooted in nationalism/regionalism/ethnicity, rural-urban divides, gender, religion) have been impelled by, mediate, and continue to support the (re)production of imperialist capital accumulation in different ways across the continent, remains marginal in analysis. Put simply, there is little investigation into what should be a touchstone of Marxist accounts: the varying social relations of production present within Africa itself across space and time. For instance, the view of African states and governing elites as straightforwardly compradorial neglects more complex sets of state-capital-society relations. Walter Rodney evocatively described ‘the gentleman who dance in Abidjan, Accra, and Kinshasa when music is played in Paris, London, and New York’, and this certainly captures something important about historical dynamics of imperial co-optation and subordination. Yet African states and leaders are not uniformly transmission belts for the interests of international capital and imperial states. To suggest so masks significant variation in how different African states actively engage with such forces. Over the last decade, one might compare different diplomatic engagements with Chinese/US power, different strategies of national development ostensibly primed against neoliberalism, and their differential exposure to domestic/international economic/ecological/political crises e.g. differences within and between the ‘agrarian developmentalism’ of Rwanda and Ethiopia, and the emergence of forms of resource nationalism and neo-extractivism in Tanzania and Zambia. Different economic bases and political histories and systems lead to different strategies, and have led to uneven exposure to market fluctuations across the continent in the present crisis: for instance, Zambia heavily exposed, Rwanda more stable. The neglect of domestic politics, internal tensions, and their resolution is important here. Indeed, it becomes somewhat puzzling how capital accumulation on the continent is reproduced at all. Of course – in some places and times more than others – this is achieved through coercion, militarism, and repression. But one must also be attentive to forms of distribution which selectively incorporate different social groups into the status quo. This includes wider neopatrimonial networks, but also other forms of limited social provision. Ruling elite fears of restive populations – particularly after the global food crisis of 2008 that was heavily linked to the expansion of extractive biofuel production – saw the introduction of food subsidy programmes in many African countries (Ghana, Nigeria, Kenya, Tanzania, Zambia). Such initiatives have been particularly prominent in countries where elections have been relatively competitive. The contradiction here is that subsidy programmes are often opposed by the IMF, yet work as stabilising mechanisms that seek to pacify potentially volatile African masses frustrated by the blatant inequality of ongoing extractive accumulation. The lack of an explanation for how political order and capital accumulation are reproduced across Africa leads to problems with Wengraf’s final argument. She maintains that an international process of permanent revolution through workers’ struggles can liberate the continent – all that is needed is independent workers’ organisations and better leadership. Yet this neglects how a dominant tendency of African history has been towards passive revolution: continually moments of struggle are absorbed by existing local and imperial structures, and elite power is recycled and repackaged without broader social transformation. Labour militancy is at the centre of struggles for progressive change, but only an accompanying assessment of the specific political-economic contexts in which these struggles are enmeshed can explain why these have tended to fail in the past. The prevalence of other forms of political mobilisation in particular places and their relationship to the reproduction of political order and imperial power are crucial here – ranging from ethnic divisions and religious beliefs to anti-immigration and homophobia. More focused analysis is needed to understand the manner in which imperial power interacts with local politics, and the specific obstacles faced in the formation and sustenance of progressive mass movements. The criticisms above recall Frederick Cooper’s assessment of dependency theory, where he argued that its application was ‘rather like performing brain surgery with an ax: the concepts cut, but messily’. 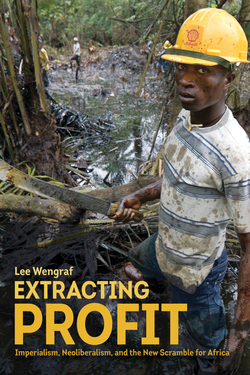 Lee Wengraf’s book is a reminder that understanding the simultaneity of extractive accumulation and the production of poverty in Africa is not really brain surgery at all: any account of the supposed failure of Africa to ‘rise’ must begin and end with Africa’s coerced/unequal insertion into the global capitalist system. Yet, the anticipated promotion of neoliberal reform will be expressed, felt, and contested in different ways across the continent, dependent on variable exposures to commodity and currency fluctuations, differing models of growth, different internal tensions, and the use of different political mobilisation strategies imbuing alternative visions of crisis resolution. Therefore, there needs to be further understanding of the diverse forms of engagement with systemic dynamics across African countries that are crucial to the actual reproduction of capital accumulation and exploitation in Africa and the world at large.